Which Trees Create the Most Mess? | Mr. Tree, Inc.
One of the most popular reasons for planting a tree in your yard is to beautify your landscape. Ornamental trees add aesthetic value to your home while also adding to a home’s property value. But while many trees will spruce up your home’s landscape, there are quite a few that can be a hassle to upkeep. These trees can make quite the mess in your front yard. The good news is that our certified arborists at Mr. Tree are skilled in knowing which native Oregon trees are likely to brighten up your landscape and which are more likely to cause you a headache. Trees don’t pick up after themselves so unless you want to get stuck with the mess that they leave behind, there are certain types of trees that you’ll want to avoid. Willow trees are one such example. These trees tend to be high maintenance with a very invasive root system. 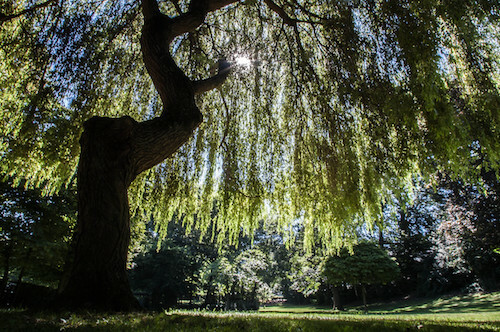 Since the weeping willow’s bark is typically brittle and prone to breakage, you could find yourself losing lots of branches during a heavy storm. These types of trees frequently shed leaves and twigs as well. In addition to the mess that willow trees can create, they are also difficult to maintain. Weeping willow trees, for instance, are susceptible to many pests. The willow borer, for example, will chew the tree’s bark, creating holes and weakening its overall structure. The tree is also prone to many common diseases, such as root rot and willow scab. However, there is good news. Willow trees are considered native Oregon trees and there are several that are suitable to be planted in our area. The Pacific Willow, the Rigid Willow, and the Scouler Willow are all amenable to the Portland environment. Like the willow tree, the ash tree can also cause quite the mess in your yard. Allergy sufferers should be weary of male white ash trees in particular. Its female counterpart, on the other hand, produces hundreds of seeds that will threaten to clutter up your lawn. Likewise, female green ash trees also produce a large amount of seeds that eventually drop to the ground and take root in the soil. They are also prone to infestations from a number of pests, including borer insects. The Oregon ash tree, however, is a native Oregon tree that is adaptable to Portland’s climate. Silver maple trees are another one that you’ll generally want to avoid for several reasons. First, like most messy trees, they produce a ton of seeds. Additionally, silver maple trees have weak wood and branches that break easily. For this reason, silver maple trees require frequent pruning to strengthen their structural integrity. Their root system is also aggressive, threatening septic tanks and underground pipes. Last, but certainly not least, silver maple trees are prone to a variety of pests and disease. Like the silver maple, the Bradford pear tree also requires frequent pruning to enhance its structure. The tree’s weak wood makes it prone to breakage, so the tree’s structure must be developed and maintained over time. Bradford pear trees also have a short life span. Therefore, the time and expense you put into maintaining these trees will likely be more effort than it’s worth. The Lombardy poplar is another messy tree that can cause you a host of problems. Like the Bradford pear tree, the Lombardy poplar tends to have a relatively short lifespan. That’s mainly due to the problems with which it is associated. First, the tree is incredibly susceptible to pests and diseases. Secondly, they frequently shed twigs and leaves, meaning you’ll need to rake the surrounding area in which the tree is located. Furthermore, the tree has weak wood and branches that break easily when exposed to certain environmental stressors. Finally, the tree’s aggressive roots can clog pipes and cause sidewalks to crack. In other words, the risks that the Lombardy poplar tree poses generally outweigh the tree’s benefits. While we admit that we like to enjoy a mimosa every now and then, the mimosa tree is likely to cause you a headache of a different kind. First, the tree is an invasive species meaning you could find yourself with one too many, likely causing you a huge migraine. Furthermore, the tree is a prolific seed producer and because of their strong taproot, the seedlings are often difficult to remove from the soil. Additionally, the tree’s aggressive root system can disrupt concrete when planted too close to sidewalks. You could certainly say that, in this case, we haven’t saved the best for last. There are many trees that can be considered messy, but the Siberian elm tree is perhaps the worst of them all. So what makes the Siberian elm tree such a nuisance? First, the weak wood and branch structure make the tree prone to damage due to certain environmental factors, such as wind and ice. Secondly, this tree is vulnerable to many pests and diseases. It’s also an invasive species that can spread aggressively because of its high rate of seed germination. So be forewarned—it’s best to thoroughly do your research before planting a tree that could grow into a huge problem a few years from now. That’s why you should always contact a certified arborist before making any final decisions. At Mr. Tree, we can provide advice on which trees to plant and where you should plant them. The good news is that there are many native Oregon trees that are easily maintained and with proper care, would be a great addition to your landscaping. So give us a call today and we’ll help you avoid a future headache….at least when it comes to your trees!